I haven't had a makeup post for a few weeks now and thought it was about time for another one. I've been fighting an eczema flare-up on my face (not a great look tbh), so I had to dig back into my backlog for this one. This was my first time as a bridesmaid, so I was really worried about the possibility of the professional photos turning out badly because of my makeup, or my makeup looking out of place compared to the bride's professionally-done makeup. Thankfully I think I did an okay job. Of course I didn't have time to take photos for this post on the day of the wedding, so I recreated the (simple) look a few weeks later at home. Us girls stayed hydrated and ate well for the days leading up to the wedding. We all planned activities with a lot of sun exposure like swimming and hiking for after the wedding, in case we got sunburned or tanned significantly. We also got the rowdy girls' night out stuff out of the way long before Hawaii, so we were bright-eyed and well-rested for the morning of the wedding. 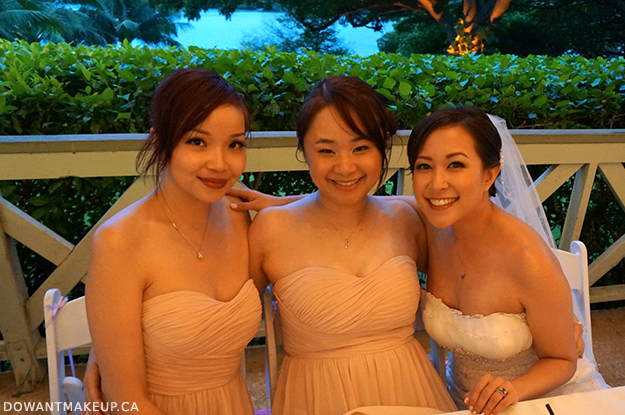 I don't usually prioritize longevity in my makeup, but this time I definitely had to make sure my makeup would last all day, from bridal party photos early in the morning in the humid Hawaii weather, to dancing in the evening at the reception. After applying a chemical sunscreen (physical sunscreens can create a white cast in flash photography! ), I used Clinique Superprimer Universal Face Primer create a smooth canvas on which I built the rest of my look, and also to extend the wear of my makeup. For the foundation, I first used a very very light layer of IOPE Air Cushion Compact in N23 as a base and for additional sun protection (SPF 50/PA+++). The main foundation muscle, though, comes from Clinique Beyond Perfecting Foundation + Concealer in 4 Creamwhip, buffed in with the Urban Decay Optical Blurring Brush. For my undereyes, I used NARS Radiant Creamy Concealer in Custard to brighten and cover. For any other areas that needed extra coverage, I went back with the Clinique Beyond Perfecting Foundation with a domed concealer brush. Lately I've been reaching for Sephora Bright Future Gel-Serum Concealer in 09 Sablè though. I used the teeniest amount of Youngblood Hi-Definition Mineral Perfecting Powder in Translucent to set my makeup and again, extend wear time. I'm always careful about using "translucent" setting powders sparingly as the silica can reflect flash photography. I pressed Hourglass Ambient Lighting Powder in Dim Light all over my face with a flat face brush for a little bit of additional coverage and that all-over Hourglass radiance. The Lise Watier Rivages eyeshadow palette is perfect for a beachy, more relaxed wedding look because of the warm-leaning earthy shades and soft shimmer. I used a dusty rose and pale bronze on the lids, plus the teeniest bit of deep brown in the crease and the same pale bronze on the lower lashline. For brows, there can be no other but Anastasia Beverly Hills Dipbrow Pomade in Medium Brown, paired with an angled brow/eyeliner brush. The waxy/cream texture has great longevity on its own, but you could also "set" it with a brow powder on top as well. To give my brows a little extra boost, I use either the NARS concealer just underneath and above the brow (it covers up all those tiny super-fine hairs and acts kind of like a more natural brow highlight) or Chella Ivory Lace Highlighter pencil. To set my brows in shape, I used my trusty (and super affordable) Milani Brow Shaping Clear Wax pencil in 01 Clear. Again, I am really bad at putting on falsies. In these photos, you can see that my natural lashes have started drooping downwards again! On the wedding day, I curled my lashes and used the dark tone Duo lash glue to attach the D.U.P Rich 805 falsies, then finished with a very light coating of Lancome Definicils Waterproof mascara to "bond" the falsies and my natural lashes together. The D.U.P lashes are so gorgeous: the lashes are crossed, and they start shorter close to the inner corners and gradually get longer and thicker in the middle and outer corners--both features create a more "natural" look to help balance out the dramatic length and volume. To contour, I used my favourite Becca Lowlight Sculpting Perfector and my fingers to draw a line in the hollows of my cheeks and then blend upward. I know you're thinking it's sacrilege to go back and use a creamy product after I've already powdered my face, but it's a habit I've developed and it works fine for me. I set it with a very light application of NYX Blush in Taupe afterwards; I also used this with a very small fluffy brush to define my nose bridge a bit. Annabelle blush in Hibiscus is perfect for a Hawaii wedding, and not just because of the name! The coral shade is so pretty, and the gold shimmer throughout gives a very luminous finish to the cheeks. 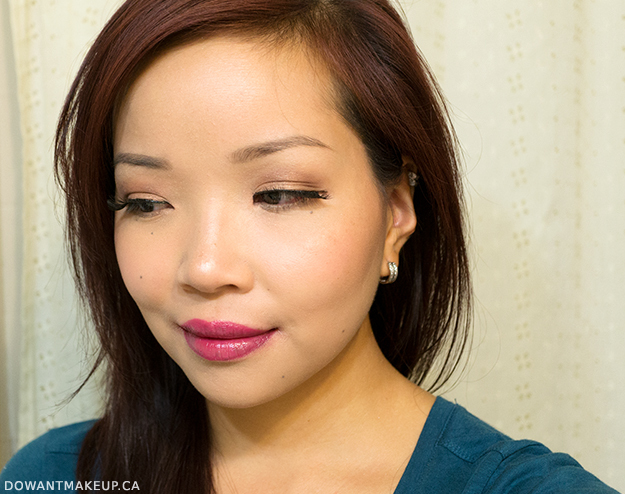 Last but not least, I used Sonia Kashuk Lustrous Lip Shine Crayon in 02 Orchid for a glossy but not super-shiny lip. The first thing I do when I start putting on makeup is to apply a lip balm to prep my lips. This gives it some time to sink into my lips and really do a good job of softening and hydrating. If there's any excess, I kiss it off on to the back of my hand or a tissue so that the lip colour doesn't slide around on top. Okay, I think that's enough of my face for now. For a more formal wedding, I might have tried more dramatic or heavy eye makeup, but I feel like my personal preference for a lighter look worked with the low-key but elegant vibe. When working with lots of layers of different products, my advice is to be patient. That means giving each layer of makeup a minute or two to set before moving on to the next step. I let the primer settle in before applying the IOPE cushion foundation, then let that settle in before applying the Clinique foundation, etc. It's a bit like trying to make a multi-layered dessert LOL. Try to throw in the next layer too early, and it might just get mixed up with the layer below instead of sitting nicely on top. Maybe that's stating the obvious, but given some of the horror stories I have about makeup SAs eager to demonstrate the whole product line on me, I think it's worth repeating! What tip/piece of advice do you have for someone doing makeup for a special event?